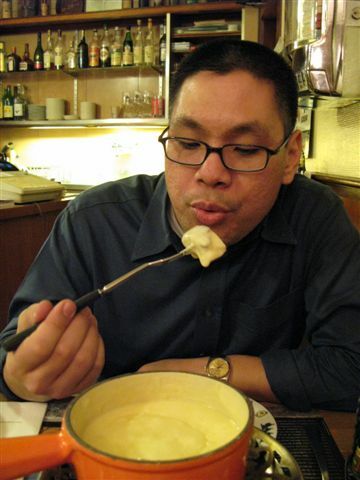 In my seven-day stay in Switzerland, I have fondue four times. It’s not a dish that I can tire of. After all, who doesn’t like melted cheese? 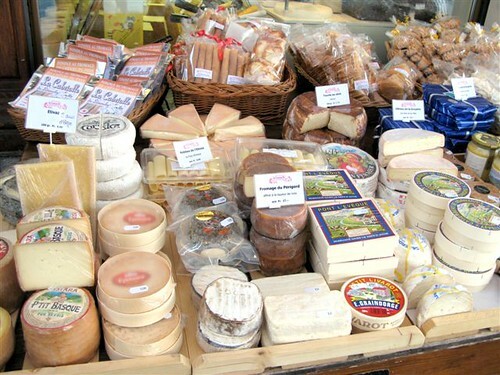 But cheese isn’t the only thing the Swiss eat. Depending on where one goes in Switzerland, the locals will be speaking French (in the west), German (predominates in the north, east, and center), or Italian (in the south). It’s because of these closely linked linguistic lines that result in a confluence of cuisine. Hence, pasta and risotto co-exist comfortably on the same menu with strudel, fondue, and sausages. 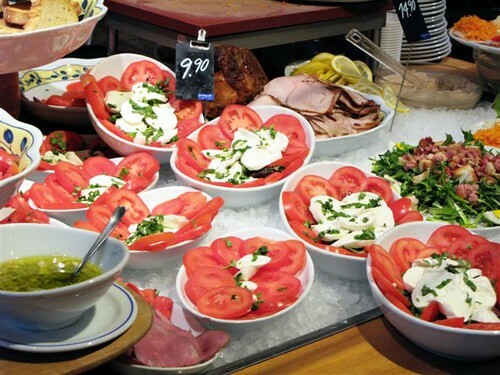 Language differences aside, all Swiss are linked by their love for salads, cheese, and bread. Low or no-carbohydrate diets are non-existent here. Definitely my kind of place, yes. 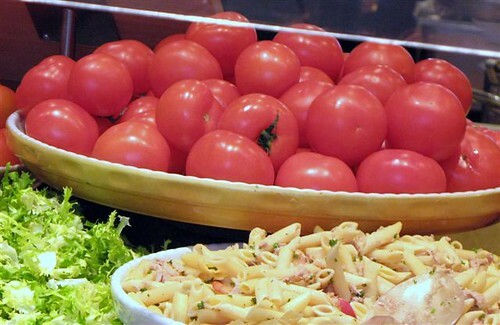 Nouvelle cuisine is frowned upon, or at least looked on with some degree of suspicion, and establishments serving international cuisine are almost exclusively located in the big cities like Zurich and Geneva. 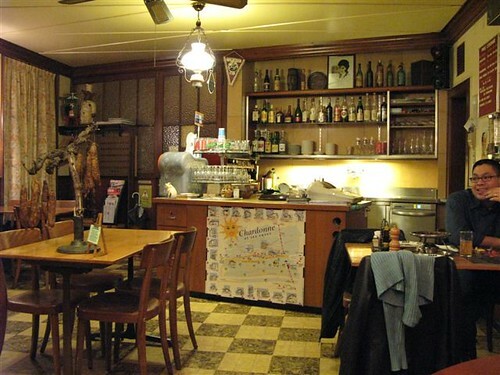 Most Swiss restaurants are homely, serving classic, traditional food, like Café Au Bon Vin, a family-run restaurant in Chardonne that my Bin and I like so much that we eat there twice. The man of the house is very proud of the sausages he makes, even going to the extent of showing us his rows of sausages drying in the back room. 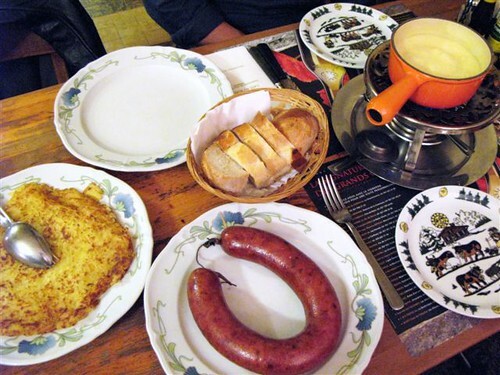 We eagerly order the saucisse et rÃ¶esti (sausage and rÃ¶esti) along with a traditional cheese fondue made with Emmenthal and Gruyere. It’s a meal that illustrates the Swiss culinary dictates that sausages are legion and potatoes are practically compulsory. The fondue arrives first and as my Bin and I settle into dunking chunks of bread into the cheesy, molten mass, the sausage ”“ horseshoe shaped and intimidating — (“how will we ever finish this?”) — makes its debut. 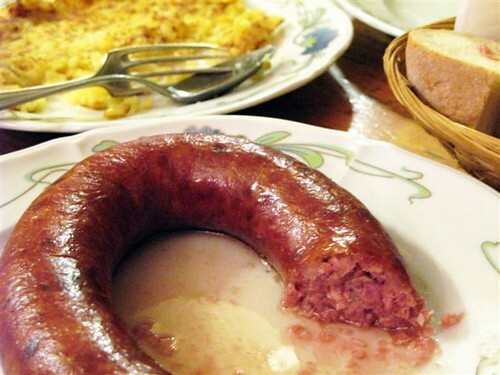 The restaurant owner tells us, in his carefully pronounced English that we “must be careful when cutting into sausage.” Seeing tufts of steam evaporating into the air, we gingerly pierce the sausage’s exterior with the tip of a knife and are instantly rewarded with a pool of juice oozing from its insides, rivers of salty brine. On cue, my mouth waters. French food and wine critic André Simon (1877-1970) once described sausages as “tasty little bags of mystery,” and that, truly, is what they are. Resolutely robust and teeming with porcine gloriousness tinged with just a hint of pepper and smoke, the meat tumbles from its casing with gentle prodding. With discreet glances at the Swiss couple beside us, my Bin follows their lead and scrapes off the meat, leaving the skin on the plate. I, a proud member of the clean-plate-club, devour the sausage, caul (sausage skin) and all. Eaten alternately with bites of rÃ¶esti, we are transported into a utopia from which we don’t want to return. 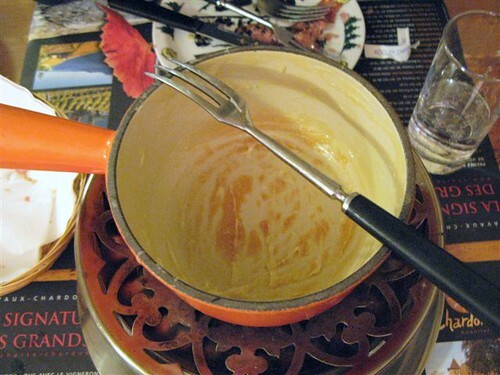 Fondue has one final reward for its devotees, the golden brown crust (tutong) that covers the bottom of the pan known as la croute, or more reverently as la religieuse. For those who understand the wonder of such things, it’s an honor to scrape this crust off with the fondue forks, a crispy finale. 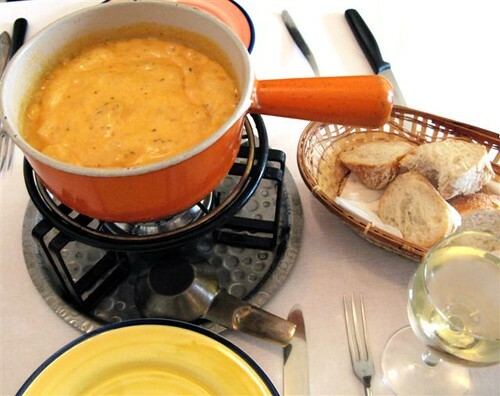 A not-so-traditional but fairly common fondue found in Switzerland is tomato (cheese) fondue. Seeded tomato chunks are softened in a hot pot along with olive oil, garlic, and onions. Perhaps some tomato puree will be added as well for that delightfully rosy hue before adding the requisite cheeses and white wine. It’s this that my Bin and I have at a small café in the heart of Geneva’s Old Town, a small café called Le Boel. Called Fondue ProvenÃ§ale, it’s just as creamy and irresistible as the traditional cheese fondue with an added taste element of thyme. Délicieux! 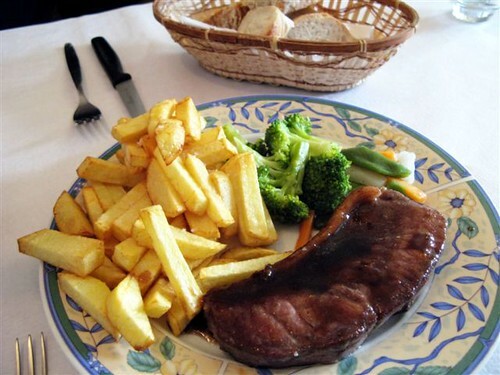 We also have their steak beurre maison, a thick cut with potato frites, but the meat is tough and dry ”“ it’s the only “bad” food we encounter on this trip. Perhaps knowing that the Swiss generally eat twice more pork than beef should have tipped me off on this one. 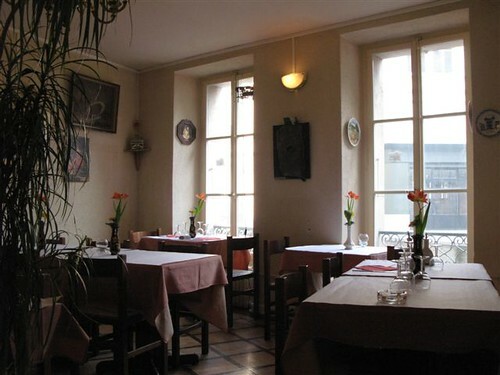 Le Boel is also the only restaurant we find in Switzerland that serves le fondue chocolat, chocolate fondue. It’s well known that the Swiss are the world champions in chocolate consumption ”“ an impressive 10.5 kilos (23 lbs.) per person per year. That comes out to about one regular-sized chocolate bar per person, per day! I must say however that I don’t know where or when they eat all this chocolate because for the entire time I’m in Switzerland, I don’t see too many people walking around munching chocolate. Yes, there’s chocolate everywhere, but not too many people eating it in plain sight. 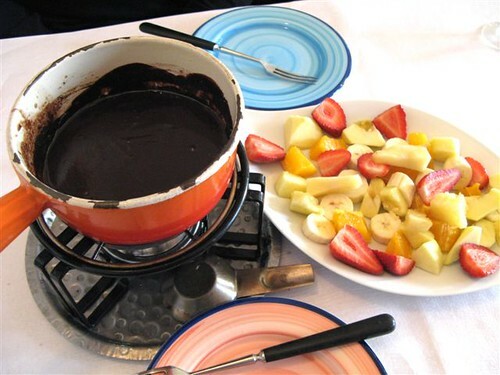 When it comes to chocolate fondue, it seems that the whole world loves it ”“ except for the Swiss. 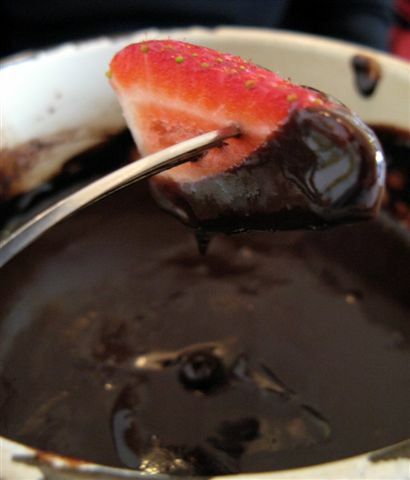 Despite their love for all things chocolate, they draw the line at chocolate fondue, which they consider an aberration, as well as “too much work,” according to the waiter at Le Boel. Who has the time really, to slice and dice fruits anyway? Still, to have chocolate fondue in Switzerland is immensely gratifying, never mind that the chocolate is a little too dark and bitter for me. I find myself missing the Toblerone fondue atOld Swiss Inn. 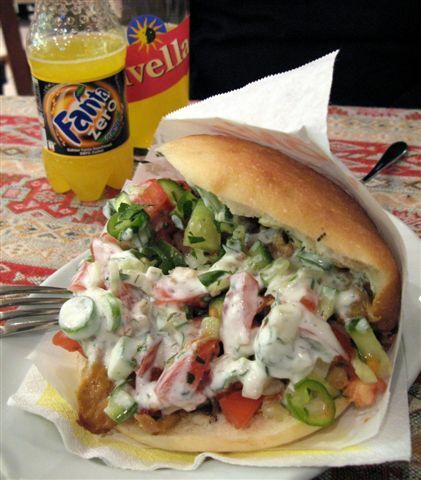 … and again in a gyro at a kebab place in Vevey. When it comes to coffee, Switzerland is no different from any other country. 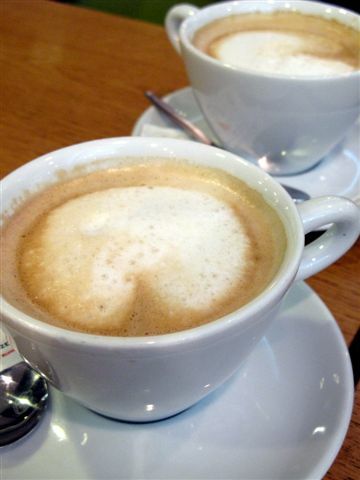 The Swiss love their coffee, and I come to love something they call café renversée, a frothy, French-style café au lait that revivifies and cuts through the chilly air. Our last day in Switzerland is my birthday, and to celebrate, my Bin and I have le pique-nique (picnic) at the waterfront in Vevey. We buy a little of all the foods I love: a thick baguette possessing an insistent, irresistible smell of wheat; sharp cheddar and aged Gruyere; millefeuilles with custard dribbling down its sides; Schweppes citrus drinks that my Bin has grown inordinately fond of on this trip; and a roasted pepper and olive “pizza” layered on puff pastry. In the coolness of noon on my special day, I hear the occasional chirp of birds and the wind kissing our cheeks. Occasionally, a gutsy pigeon approaches to nab any stray crumbs (there are many) that fall to the ground. 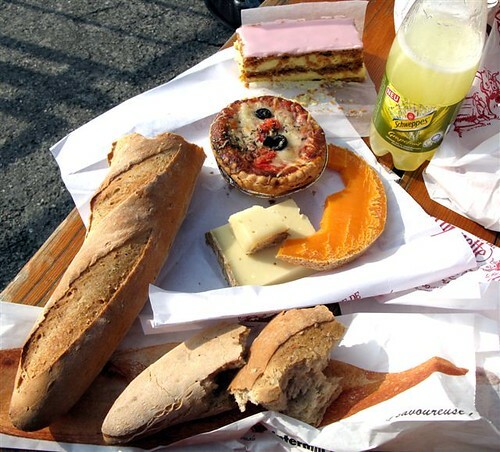 In between crunchy bites of his millefeuille (my Bin), and my wrestling with the baguette’s chewy crust (me), we talk softly about our trip and the special memories that we’re taking home, experiences that are already giving me heimweh (“homesickness”) for Switzerland. After all your posts, I am now seriously, seriously craving roesti. I do so love that dish, and don’t often see it. Even less often, see it done well, with the obligatory golden-brown, crunchy top. I had a good roesti in Puerto Galera once, since a lot of German and Swiss tourists go there and many restos serve European cuisine. Would you know where there is good roesti in Manila? where in Manila can one have good roesti? maybe Swiss Inn? or the German Club in Makati? I’m not sure about Manila, but this I can tell you: the BEST roesti you can have comes with the most scrumptious cholesterol-laden breakfast you can gorge your hungry self on at Jun and Maricar Sacapano’s breakfast/lunch counter at the Barracuda Bar in Boracay: roesti with melted gruyere which I have with an order of cervelat sausage and fried egg (some brave souls with stout hearts ask for TWO eggs) and delicious thick nice bread from the Swiss bakery slathered with Anchor butter (unfortunately the coffee there isn’t good – I usually have mine at Juan Elizalde’s Cafe del Sol at D’Mall after breakfast- their coffee is specially ground for them by Boyd’s. – good!) the whole gorgeous meal costs about P275; Barracuda Bar’s located not far from where Regency resort hotel (if you’re coming from D’Mall) is. I enjoyed all the articles and pictures of Switzerland and, earlier, Japan, Netherlands and all the other places you’ve been to. I don’t usually post comments (like perhaps most of your visitors) but I do read your blog regularly. These are all beautiful pictures and insightful articles. Could be the closest I could get to “being” in Switzerland. Cheers! Oh Lori! My tummy is roaring now! What a glorious pot of melted cheese! I like the color of the tomato fondue too, but my heart is a traditional sort, so I now hanker for a pot of basic fondue, to dip some bread in. Sigh. I think I will be left making myself a grilled cheese sandwich instead. love all kinds of fondues!!! Breakfast at Antonio’s in Tagaytay makes good roesti. Still not in Manila, but close enough to drive to if the craving is bordering on insane. Saucisson vaudois ROCKS! I first found it in Santis, about a year-and-a-half ago, and until reading your blog, did not realize that Vaudois refers to the Vaud canton in Switzerland. 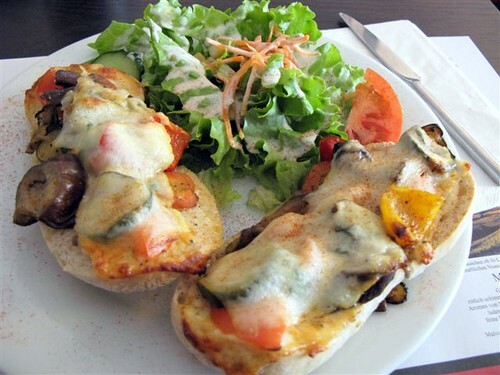 A friend introduced me to your blog, first because I am a Pinay foodie in France. And to this series in particular because we will be moving to Vevey soon. Sausage, here I come! Thanks for sharing your food adventures. well, one thing’s for sure — EUROPE is indeed THE BEST! Thank God I live here! Jul 18, 2011 M.I.Y.O. Monday: What Are Your 2 Favorite Dimsum Dishes?